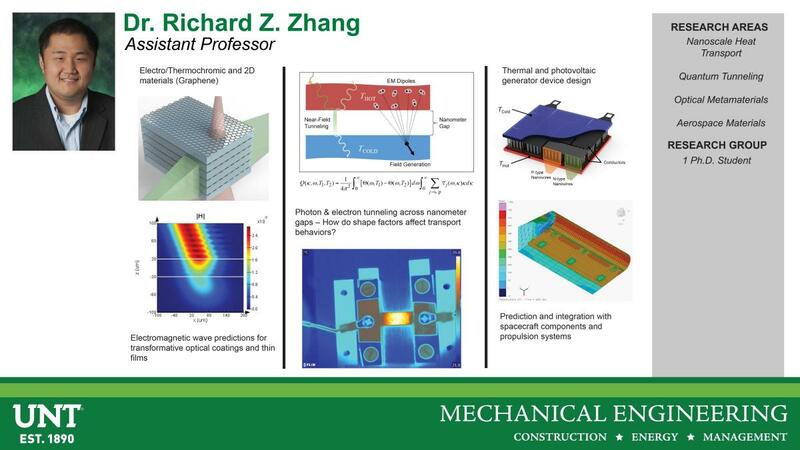 Research and innovation are integral parts of the Mechanical and Energy Engineering department at The University of North Texas, a Carnegie Tier One research institution. The department offers state-of-the-art facilities ranging from a variety of instructional laboratories to research facilities including the Net Zero Energy (ZØE) Research Laboratory. These facilities allow our faculty and students to work side-by-side on industry-sponsored senior capstone design projects or on cutting-edge graduate research. The department’s research focus areas are Materials/Manufacturing/Mechanics, Thermo/Fluids, Controls, and Energy. Faculty, post-doctoral researchers and student teams work on exciting inter-disciplinary projects on robotics and controls, manufacturing of composite and engineered materials, characterization of high-performance structural material, air quality modeling and environmental monitoring. They are also developing next-generation sensors for extreme environments, and energy harvesting using phase-change materials. If you are interested in partnering with the MEE Department or if you are a prospective graduate student, email us at mee@unt.edu or contact the department at 940-565-2400. Learn more about the program and how to sponsor a project.